As a person owning or running an optical business, you might have already learned from first-hand experience that ups and downs are indispensable parts of being in business. Yes, there will be the highs where you will pop your favourite champagne and celebrate, but there will also be the lows where you will be forced to sit back, contemplate and in extreme cases rework your entire business strategy. Every business, irrespective of the domain that it is operating in, goes through such difficult times. However, during these hard times, businesses have two choices, either to stand up to the challenge and face it or succumb to the pressure and perish. If your business is grounded by the right business values, it can continue to move towards the shore, not just survive but grow as well. Basically, if you are finding it difficult to sustain and make the required amount of profits, then you need to go back to the drawing boards and analyse the values that have been governing your business processes so far and be prepared to make the change. Today, optical businesses are under the same pressures that many other retail businesses are struggling against. Generating profit is essential in order to sustain and thrive amidst the immense competition that is growing by the day. In such a scenario, if you are planning to incorporate a new set of values into your business model, then retail management might just be the place to take inspiration from. Listed below are 9 retail values that if applied successfully will transform your business guaranteeing the growth that will help you earn more. If we had to highlight one thing in particular as being the most important asset to your optical business, then that would definitely be your clients. Yes! Customer is the king and it’s vital for businesses to accept this fact while planning their strategies. The service that you deliver to your clients through your store or set-up is crucial in having them come back to you for more. Before selecting a product, you need to understand where it falls in this life cycle as this will help you to make the best decision. In order to make the right amount of profits, you also need to select the products that will give you the most suitable margins. Basically, the point is, don’t choose to stock an eyewear product which is already in its decline phase. Such moves can only damage your business. Pricing is often a sensitive area for opticians while planning their retail strategies. For opticians, the temptation lies in setting a price point that allows them to earn maximum profits. Yes, it is important to set the right margins. Having said that you also need to understand that it is equally important to perceive the spending capacity of your clients and the value that the product will give to your clients. Ultimately, you need to understand that pricing your products aptly could be a huge factor that governs the success or failure of your business. While making the pricing decision, take into account details like the client’s perceived value of the product, the value that he/she is willing to pay for it, and how the value that you set will govern the client’s perception of the product’s quality. You might be offering the best service and the quality of your products might well be top-notch but if your potential customer does not know about your business, chances of him appearing at your store for a purchase is minimal. What does this mean? To put it simply, it means that it is very important for you as the business owner to advertise your services. How else do you expect a potential customer to understand what you offer? Basically, setting aside a budget for marketing is important. And it is equally important to spend it in the right marketing channels for maximum effectiveness. Times change and so do places. A place which was dead as a market a year back might just spring to life due to the recent development plans implemented by the local authorities. Similarly, even the most happening places could go dull in a matter of years. As the owner of your optical business, you need to capitalise on the location of your store. Ideally, choose a location where you have a high chance of reaching out to more consumers. You need to consider the physical location of your business in terms of the available demand, selling strategies that can be employed, products that can be sold and a host of other factors. Old is gold, you may have heard that phrase often but when it comes to eyewear business, there are times when old may not sell. Yes! Your customer will be interested in buying what is new in terms of trends as well as technology. A facelift might often not be possible for you but you should definitely consider changes at least every 10 years. If a major revamp is not aligned with your budget, then it is better to focus on the simple details like maintaining cleanliness, alternating lights that focus on your frame displays, colour coordination etc. and of course remembering to update your inventory regularly. The way you serve your customers is vital to the success of your business and your staff’s skill levels determine the quality of service that your business will offer. A skilled and motivated team will go that extra mile while serving the customers and keep them happy at every cost. For instance, little details like being updated with the latest collection or knowing about the latest trends, technologies, etc. will ensure that your sales staff is able to have a meaningful conversation with your customer. Hence, training your staff about the products, best practices, soft skills, etc. is vital in building a proficient business. Moreover, employees that are trained and are capable of seeing the bigger picture are self-driven and tend to perform much better. Competition is good, provided you know how to use it to your benefit. 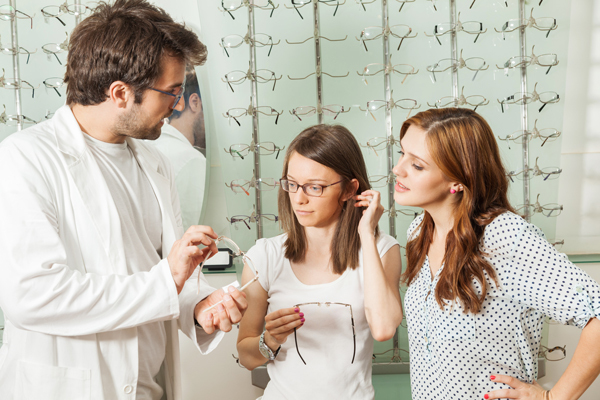 Have a keen eye on all the local optical practices, their pricing strategies, promotions that they are busy with and try to analyse what is not working for them. All this knowledge will not just give you a competitive edge while making decisions but will also help you avoid the mistakes that your competitors have been making. In today’s volatile times, an eyewear trend or even the technology in vogue may just vanish away in a matter of months. Yes, this is possible and for your business to ride through these uncertainties, you need to stay on top of the various trends that are floating around in the world of eyewear fashion. you prepare a better sales pitch for your team. At the end of the day, it is important to understand that change is the only factor constant. Optical businesses that are willing to pivot and change for the good are the ones that will thrive in spite of the ever growing competition. Keep your customers first, explore new possibilities to make a difference in their lives, and this in turn will propel your business far above the competition.